This was a shot I took with a view to the Circle challenge but I didnt feel it was right for that. A lot of processing later and I have arrived at this image. I like the colours in this a lot. We we heading down to Taupo for a wedding and I saw these sunflowers at the side of road. I knew then I wanted to take a shot for the circle challenge on the way back. When it come to heading back home we had stopped at my Mother-in-law's in Hamilton and Conor (10 months then) had just gone to sleep in the car. We didn't want to wake him so my wife quickly stopped the car and I snuck out trying not to wake Conor and got off half a dozen shots. Back in the car I noticed that I had forgotten to check some camera settings: ISO in particular! I always forget that one. The images were a little overexposed. The day I took this was a bit windy hence the petals at the top right aren't in a nice circular formation like the rest but I think that just adds interest to the image. Yellow ribbon for the yellow flower! COOL! I'm diggin' this flower photo big time! Congrats! One of my faves ! I just love this! I keep coming back to look at it and am adding it to my faves. You did an outstanding job with the post processing! This is slick. I'm diggin it. Nicely done and congrats on the Ribbon. Goooooo Kiwi!! Congrats Gerry on your very well deserved ribbon. This is a very beautiful shot, superbly edited. Amazing editting that brings lots of life and vibrancy to the image. Fantatic shot and well deserved ribbon. 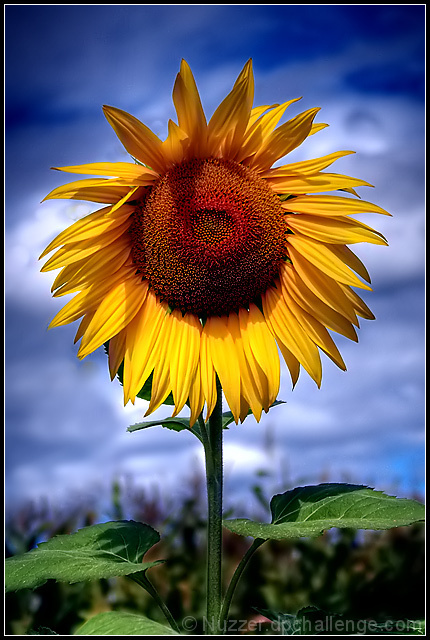 I love sunflowers and this is an amazing shot, congrats!! Great work outside the camera. Good show my friend. Flower shots are hard to get in the top around here. Awesome processing. Awesome shot!! The processing is wonderful! Congrats on the Yellow Ribbon!! this really is exceptional...well deserved! Wonderfully done, the PP work really caught my eye. Congrats! The first reaction I had looking at this image was: "Wow, that's some beautiful post-processing." The original image looks pretty, but unexceptional. The new crop makes it a lot more interesting - the picture turns into a portrait, with the personified flower reaching out towards you at the centre of it. The tonemapping makes the image a lot more dramatic, and I like the effect of the gradient fills. The border works well too -brings out the image without dominating it. I don't think I really have any objections. It's difficult to take interesting pictures of flowers, but you've really succeeded - the flower looks alive, vibrant, and surprisingly person-like. Beautiful, beautiful shot. Congrats on the yellow. Hi, Congrats for the ribbon. I'm really amazed at how you edited this picture. Would it be possible to write a detailed tutorial setting out the steps in detail? Thanks. This is a real stand out shot. I can't believe it was such a simple photo that was totally transformed by fantastic processing. Great work and congratulations. Congrats on the yellow, great colorful shot, would have made it in "Circle" too, I believe. well done on the ribbon, your certainly deserved it with this shot. Thanks for the detailed PP as well, it was very interested. great work! Whoa! Congrats, my man! That is awesome! Way to go Gerry, spectacular photograph. Editing is amazing, you've given it so much life. Congrats! This is such a cool shot, I am really glad it ribboned, it was one of my favorites in this challenge. Very strong finish,congratulations on the ribbon. Congrats! Trying to be like Scalvert eh? I like the bold colors and the sharpness. Seems like there is a cloning artifact in the sky. One of my favorite flowers and you caught the "majesty" and "heighth" great! Great colours, lighting. A little over-saturated but that's what makes it pop! 8. This is a great capture!!! The contrast in colors, the brightness, sharpness...Everything! One of the coolest sunflowers I've ever seen! Very nice. Beautiful colors and post-editing! I love it! Very crisp image and bright colors. there is something very funny about this...very well done! Right then, joke's on me as I now have to plough through 564 images and bump them all (yes, all of them) up. There'll be a third run through for fine tuning. It's day two now and I'm running late, sorry. Oh one of my favorite photo subjects, and so very nicely done!! I love the colors, the sky, the clarity, the everything a 9. Beautiful!! That is so 3-dimensional looking. Amazing depth and focus! Great clarity and interesting considering it's a sunflower! Proudly hosted by Sargasso Networks. Current Server Time: 04/21/2019 05:02:45 AM EDT.